A tax that a country imposes on its imports and, occasionally, exports. A duty exists to make an import more expensive and to thereby encourage people to buy goods produced in their own country. Proponents of their use argue that duties discourage outsourcing of jobs to other countries and make the country more self-sufficient, but most economists agree that they are economically inefficient and some contend that they may ultimately harm the people they are intended to help. A duty is also called a tariff. See also: WTO, International trade, Globalization. A tax levied on a good imported into a country. In most instances, tariffs are intended to make imported goods more expensive and thus less competitive with domestic products. Also called duty. See also General Agreement on Tariffs and Trade, trigger price. a specific duty which is levied as a fixed sum of money per physical unit of the product. Governments impose tariffs primarily to protect domestic industries from overseas competition, in order to maintain a local production base and to prevent job losses. Additionally, governments use tariffs to assist the BALANCE OF PAYMENTS, and also as a means of raising revenue. Since 1950, the tariffs which were once applied at substantial rates on an extensive range of internationally traded products have been either reduced or eliminated, as a result of the work of the WORLD TRADE ORGANIZATION and the formation of various free trade blocs. (See TRADE INTEGRATION). Firms facing tariff obstacles to overseas markets may choose to absorb the duties payable by lowering profit margins, or they may be able to remain price-competitive by increasing productivity and reducing their supply costs. A further option open to MULTINATIONAL ENTERPRISES is for them to replace exporting by setting up manufacturing plants in the markets concerned. See PROTECTIONISM, DEINDUSTRIALIZATION, FOREIGN MARKET SERVICING STRATEGY, LOCAL CONTENT RULE. a charge for the consumption of a product or service, for example a meals tariff at a restaurant, or a tariff for gas and electricity supplies. Two-part tariffs are often used in connection with the supply of gas, electricity telephone services etc., involving a charge per unit of the good or service consumed, plus a fixed annual or quarterly charge to cover overhead costs. Two-part tariffs can be used by PUBLIC UTILITIES or firms to achieve the benefits of marginal cost pricing whilst raising sufficient revenues to cover total outlays (so avoiding a deficit). Additionally multi-part tariffs can be utilized to reflect the different marginal costs involved in offering products such as electricity, and rail and bus services at peak and off-peak periods. specific duty, which is levied as a fixed sum of money per physical unit of the good. Tariffs are used to protect domestic industries from foreign competition and to raise revenue for the government. 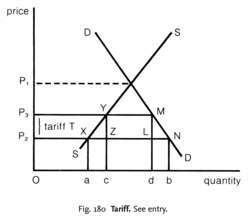 The economic effects of a tariff are illustrated in Fig. 180. In the figure, DD and SS are the domestic demand and supply curves of good X. In a closed economy assuming perfect competition, the domestic price is OP1. Consider now an open-economy situation, with the world price for this particular good being OP2. Assuming that the country's demand for good X accounts for only a small fraction of total world demand for the good, such that it is unable to affect the terms of trade of the good, then, under conditions of FREE TRADE, the domestic price will also be OP2. At price OP2, domestic consumption is Ob, domestic production is Oa, and imports, being the difference between the two, are equal to ab. The imposition of a specific tariff, T, will cause the domestic price of imports to rise by the full amount of the duty, to price OP3 in the figure. At price OP3, domestic consumption falls from Ob to Od, domestic production increases from Oa to Oc, and imports are reduced from ab to cd. The area YZLM (import volume cd times tariffper unit OP2 OP3) represents government revenue from the tariff. Although producers of the protected good gain by now being able to increase their supply of the good (that is, from Oa to Oc), the overall effect of the tariff is to reduce the productive efficiency of the economy and consumer welfare. The triangle XYZ represents the ‘production loss’ to the economy. Under conditions of full resource employment, production in the tariff-protected industry can be increased only by diverting resources away from other (nonprotected) industries, which rank higher in the order of productive efficiency. Thus, some resources are allocated less efficiently as a result of the tariff. The triangle LMN represents the ‘consumption loss’ (loss of CONSUMERS’ SURPLUS) to society. As a result of the tariff, some buyers are forced to switch to less desirable substitute products while those consumers continuing to buy the good are now forced to pay a price for it that is in excess of the real economic costs of supplying it. How effective the tariff is as a means of protecting the domestic industry will depend upon the PRICE-ELASTICITY OF DEMAND for the imported good. If import demand is highly price-inelastic, there will be little reduction in the volume of imports. In these cases, a more effective means of protection is a QUOTA that places a physical ceiling on the amount of imports permitted. See also PROTECTIONISM, NOMINAL RATE OF PROTECTION, EFFECTIVE RATE OF PROTECTION, WORLD TRADE ORGANIZATION, TRADE CREATION, TRADE DIVERSION. The same tariff remained effective until now even though Nepra had subsequently started reducing average national tariff. In response to the request, the Finance department said that it is amenable to the proposed reduction in tariff on chipping potatoes to "help domestic potato manufacturers. It has led to dramatic interference of government in the economic activities, specifically in the field of trade policies where Iranian tariff regime is characterized by high average tariff (nominal and import-weighted tariff), an extremely high dispersion of tariff levels across tariff lines and a significant amount of tariff escalation. According to the order only those companies who have been recommended by the relevant agencies, those who could certify that they would install new plant and machinery of international standard, and those who have installed capacity of up to 250 MW would be eligible for this tariff. EDF's standard tariff is PS1155 - PS157 more than their PS998 cheapest tariff. In the data, the largest tariff increase--roughly 40 percent--led to a tripling of imports in the months preceding the tariff hike and a collapse of sugar purchases for several months afterwards. Also, consider pursuing cases under Section 337 of the Tariff Act of 1930 (19 U. For ACFTA, the total tariff reduction value for Indonesia ($1. Industry observers expect voice tariffs to gradually rise. The Economic Coordination Committee (ECC) of the cabinet approved the increased tariff through circulation of the file containing different schedules of tariff and the federal cabinet would endorse it soon. This leads to the submission of inaccurate or incomplete information which contributes significantly towards increasing the time taken by NEPRA to issue its determination on the tariff petition.